The banana pepper is a mild, medium-sized chili pepper with a tangy, slightly sweet taste. It is typically bright yellow, but matures to green, red, or orange. 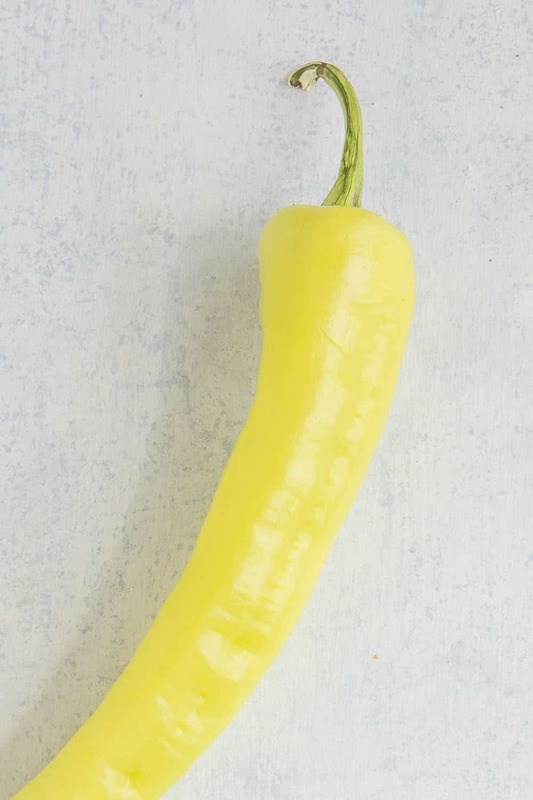 The banana pepper is a mild, medium-sized chili pepper with a tangy, slightly sweet taste. It is not considered a hot pepper, offering either no heat or a slight tingle. Compared to the mildest jalapeno pepper, it is 5 times milder. Also known as the yellow wax pepper or banana chili, the Banana Pepper has a mild, sweet taste that is very popular on many types of foods. It is commonly eaten on pizza, in Greek salads, on sandwiches, or stuffed with meat and/or cheese. They also add a bit of sweetness to salsa and an interesting flavor, while other peppers add the heat. They may be pickled or used fresh. Pickled banana peppers are very popular, often confused for pepperoncini peppers. As the name suggests, it is typically a bright yellow or yellow-green, but they may mature to orange or red if left to ripen. How Hot is a Banana Pepper? Banana peppers are not consider hot peppers, giving either no heat at all or a very mild kick at 500 Scoville Heat Units. Compared to a jalapeno pepper, which measures from 2,500 to 8,000 Scoville Heat Units (SHU), the hottest banana pepper is actually 5 times milder than the mildest jalapeno peppers. That is quite mild. Other peppers you might be familiar with in this range include the Anaheim Pepper, which measures from 500 to 1,000 Scoville Heat Units, the Cubanelle Pepper, which ranges from 0 to 1,000 SHU, or the pepperoncini, ranging from 100 to 500 SHU. Learn more about the Scoville Heat Scale here. I’ve grown banana peppers in my garden on and off over the years and consider them fairly easy to grow. The plants enjoy full sun and they grow with fairly thick walled flesh. That’s a positive when you cook with them like I do, making them ideal for everyday chopping and slicing, but also for stuffing or pickling peppers. You can cut them into pepper rings and pickle them quite easily. Treat them like other Capsicum annuum varieties, as they require no special treatments or considerations. Plants will typically reach 1 to 2 feet tall and can be grown in many climates, though like most pepper plants, prefer warmer climates. I’ve grown them in zone 5 without any issue. What Can I Substitute for Banana Peppers? If you are unable to obtain banana peppers, look for the pepperoncini. Pepperoncinis are usually pickled, and they are great in flavor, very similar to banana peppers. In fact, banana peppers are often confused for pepperoncinis. Fresh pepperoncinis are more difficult to find, however, so you may need to grow them. A more commonly found pepper to use as a substitute would be a small sweet yellow bell pepper or a mild Italian sweet pepper. The Hungarian Wax Pepper is an excellent substitute for comparable flavor. However, the Hungarian Wax is much hotter, reaching up to 15,000 SHU. While these peppers look very much alike, they different in certain crucial ways. First, banana peppers measure at 1-500 Scoville Heat Units, where Pepperoncinis measure at 100-500 SHU. A small difference, but notable in the scientific world. Also, banana peppers are usually smooth, where pepperoncinis can have more wrinkly skin, a physical difference. In flavor, both peppers are sweet, but pepperoncinis have a reported slight bitterness compared to banana peppers. Where Can I Find Banana Pepper Seeds? You can order banana seeds online, but seeds are easily found in larger retail stores before growing season. You can either purchase them at Amazon (affiliate link) or check out my Chili Pepper Seeds Resources page. If you have any questions, feel free to email me or leave a comment below. Thank you. — Mike H.
I’ve been growing chillies and peppers for some years now but never before Banana Peppers or are they Chillies. Mine are growing upright , unlike most peppers and chillies which hang down. Is there a problem or is this natural. REPLY: Robert, some peppers do grow upward, though Banana Peppers do not. You probably have a different sort of pepper or strain. — Mike from Chili Pepper Madness.